The mighty and majestic mountains of the Himalaya form the picturesque backdrop to this unique journey. From deeply spiritual Bhutan where Gross National Happiness is the measurement of prosperity and where legendary monasteries and mandalas perch in unexpected places to magical Nepal, home to some of the highest peaks on the planet and a rich cultural heritage. Expect to be welcomed by cool, clean and fresh mountain air and the unbelievably hospitable people who eagerly share their culinary and artisanal traditions. Arrive in Bangkok, where you are met and transferred to your airport hotel. Fly to Paro, your gateway to Bhutan, a nation whose cultural traditions remain well preserved. Transfer to Thimphu, the Bhutanese capital, and visit the National Memorial Chorten, a graceful landmark with golden spires and bells. Later, see the Tashichho Dzong, a 13th century Buddhist monastery and fortress, for an insight into Bhutanese spirituality. This evening gather for your welcome dinner. Get an interesting glimpse into rural Bhutanese life this morning when you visit the Folk Heritage Museum, which replicates a traditional farmhouse furnished as it would have been a century ago. Next stop is the National Textile museum which showcases a wide range of beautiful Bhutanese textiles including the crowns and attire used by the monarchs and members of the Royal Family. It is also a wonderful introduction to the country’s major weaving techniques and local style of dress. Lastly today you visit the National Library which is an important repository of ancient Dzongkha and Tibetan texts. Drive over the Dochula Pass (3,100m), with its stunning 360-degree views and admire the colourful prayer flags en route to Punakha. Stop at historic Punakha Dzong, where the first king of modern Bhutan was crowned and continue to the Chimi Lhakhang (Temple of the Divine Madman) known as a fertility temple. Return to Thimphu for dinner. This morning, you have an opportunity to climb to the world famous Taktsang Monastery (“Tiger’s Nest”), which clings to a cliff 900 metres above the valley. This hike is a 6.5 kilometre round trip reaching heights of 2,800m. It is intentionally difficult, intended as an arduous pilgrimage for Buddhist devotees. You may hike all or part of the way. Later, visit Kyichu Lhakhang, one of Bhutan’s most sacred shrines. Say farewell to Bhutan and fly onwards to Kathmandu. In the Nepalese capital, you ride like a local by rickshaw to Durbar Square where the magnificent Taleju Temple is located. See the House of the Living Goddess (Kumari), a temple built in 1757 known both for its magnificent carvings as well as its divine inhabitant. Later on there is time to stroll through the colourful bazaar and the bustling old city with its narrow alleyways and temples. Continue to Swayambhunath, one of the most sacred shrines for Tibetan Buddhists. This evening, enjoy a lecture by a Mount Everest summiteer on the trials and triumphs facing climbers attempting to scale the world’s highest peak. This morning, explore Patan to see its Durbar Square and the former royal palace. It remains the finest collection of temples and palaces in the whole country. Afterwards, attend a Nepalese cooking class in a local home. Continue to the well-preserved hilltop town of Kirtipur and visit the temple of Adinath, the Chilancho Stupa and the temple of Bagh Bhairav. This morning, proceed to Bhaktapur, a ninth century town in the Kathmandu Valley celebrated for its glorious architecture and renowned for its elegant art, fabulous culture, colourful festivals, traditional dances and the indigenous lifestyle of its Newari community. Visit Pashupatinath Temple, a famous and sacred Hindu temple complex located on the banks of the Bagmati River, an important cremation site for Hindus. Continue to Boudhanath, home to one the world’s largest Buddhist shrines. Tonight, gather for your farewell dinner and toast your unforgettable time in the Himalaya. On Day 10, either fly to Lhasa to begin your post-tour extension or fly to Bangkok, where you enjoy the use of an executive room, available through Day 11, when you depart on your international flight home. First group event: flight from Bangkok to Paro at 6:50 a.m. on Day 2. 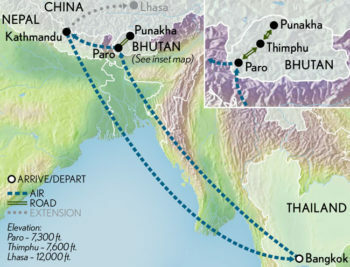 Last group event: return flight from Kathmandu to Bangkok arriving at 6:30 p.m. on Day 10.